There are several sources of air pollution in homes, schools, and offices. Some pollutants can cause health problems while other pollutants cause or worsen allergies, respiratory illnesses and heart disease. Children and people with cancer and other serious long-term conditions need to have their air quality monitored to ensure optimal, clean indoor air. Large quantities of individual pollutants—such as carbon monoxide—can cause death. Most of us spend much of our time indoors. The air that we breathe in our homes can put us at a potential risk for health problems from pollutants like smoke, chemicals, gases, and mold. Children are especially sensitive to secondhand smoke, which can trigger asthma and other respiratory illnesses. High temperature and humidity levels can also increase concentrations of some pollutants. Dust particles and dirt can build up inside your air vents and air duct system, contributing to poor indoor air quality in your home. It is recommended that you have your air conditioning ducts cleaned every year or two. Help protect children from secondhand smoke; do not smoke or allow others to smoke inside your home or car. Replace air conditioner filters regularly. Some of the newer thermostats will tell you when the filters need to be replaced. 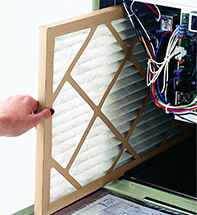 Eliminate asthma triggers like mold and dust mites with a quality air filter. You get what you pay for when purchasing air conditioning filters. We recommend that you purchase high quality air conditioning filter. Clean up mold and get rid of excess water. Always ventilate when using products like paint thinners or other chemicals and gases. Install a carbon monoxide alarm. These can be purchased at most hardware stores. Inadequate ventilation in your central heat and air system can increase indoor pollutants. To dilute these pollutants, you need enough filtered outdoor air coming inside, and you also need indoor air pollutants carried out of the home. It is possible that your air conditioning system may need to be serviced or replaced. The Tulsa air conditioning professionals at Circle B Mechanical can assist you in all areas of air conditioning, heating, plumbing, and air duct cleaning. Contact us today to request a service call or repair. This entry was posted in Air Quality and tagged Air conditioning, filter changes, humidity, Indoor Air Quality. Bookmark the permalink.